The use of credit cards has always been popular in the USA and other European countries. It’s since the early 80s that they have been using credit cards, and today, according to a survey conducted, nearly 82% of the total yearly transactions are carried out through credit cards. In India and other Asian countries, the concept of using credit cards was not so popular up until the early 2000s. Since then, however, the usage of credit cards has gained tremendous popularity in this part of the world. More and more people are using credit cards these days, and according to some experts, we are gradually advancing towards a cashless society. What do you think makes credit cards such a popular option? There have to be some additional benefits which they offer over cash! 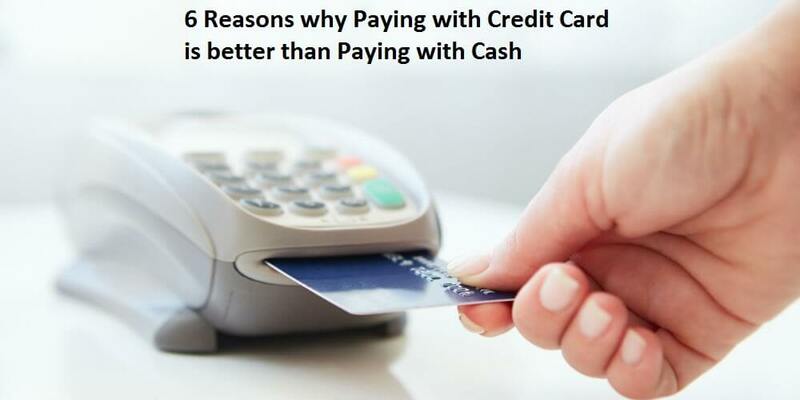 In the following section, you will be offered a brief insight as to why using a credit card is a better option than paying by cash. What makes Credit Cards Better Choice? ● Security: When it comes to cash, it is easy to lose. If you ever lose your cash and it falls into the wrong hands, there’s no way you can prevent it from being used. However, when it comes to credit cards, even if you lose it, it remains safe, as it protected with OTP, PIN and other security mechanisms. Besides, you also have the option of informing your credit card company, who would deactivate the card, which would make it useless. Therefore, from a security perspective, credit cards are a much safer options. There is another aspect that needs to be mentioned in this regard. It is the fact that with credit cards, the chances of frauds and cheats can be minimized to a great extent. ● The Name Says it All: As the name suggests “Credit Card”, it allows you to make payments in credit where the amount is being paid by your bank for the time being and you are given a certain period of time by which you need to repay it to the bank. Imagine a situation, where you don’t have sufficient cash and you need to make an urgent payment. You can easily make it by using your credit card. As long as you have sufficient credit limit, you can go ahead and make all kinds of credit card payment. Besides, even if you have enough liquid cash at your disposal, with the help of credit cards, you can make sure that they remain intact. ● Online Transaction: According to a survey, this is the digital age with more than 58% of consumer goods being purchased from online stores. How do you intend to carry out a transaction online without a credit card? Well, you might argue, that debit cards can be used! Yes, they can be; however using a debit card is as good as using cash, besides, there are many sites which accept only credit cards. This is particularly true if you are going for an international transaction. This is one of the reasons as to why the use of credit cards has become so popular over the years. They offer flexibility and at the same time allow you to carry out transactions without having dispense off your liquid cash. ● Record or Digital Signature: This is another reason why credit cards have gained such popularity. Whenever you are making any payments through your credit card, all the details pertaining to the transaction, including the name of the merchant, the amount paid, date and all the relevant details get stored in the database of your credit card company. This allows you to keep a record of the amount that you have spent and at the same time can also be useful when it comes to setting up a budget. ● Reward Points, Cashback and other Facilities: Apart from the fact that credit cards help you save cash, they can also prove to be very useful when it comes to earning money! Have you heard of cash back credit cards? These are special cards, where you get a percentage of cash back on a certain amount paid using the card. For example, you are buying a movie ticket or paying your mobile bill with your credit card, a certain percentage of the amount will be credited back to your account. Besides, these days, credit cards offer different types of offers in terms of reward points and bonuses. ● Paying in Installments: Are you planning to make a purchase which is worth a considerable amount of money? If you pay in cash or by debit card, you will have to pay the entire sum on a single go. However, with the credit cards, you have the option of converting it into EMIs, or Equal Monthly Installments. In this process, the entire sum is deducted from your credit card and is paid by the bank to the merchant. What you need to do is to repay the bank on a monthly basis. The amount that you need to pay depends on the rate of interest, processing fees and the time period you have opted the EMI for. This can prove to be very useful as it allows you to save your money and at the same time, you have the option of paying in installments. Apart from these, there are various other reasons that can be cited in favor of using credit cards. However, the fact that they allow you to hold back on your liquid cash, makes them so popular among common people. When it comes to using credit cards, in order to make proper use of them, you need to make sure that all the dues are being paid on time. This is one important aspect that you need to take into consideration. If you are using a credit card, then make sure that you use it judicially. Making timely payment of the credit card will not only help you with your credit scores but at the same time, it will also make sure that your credit limit is enhanced.